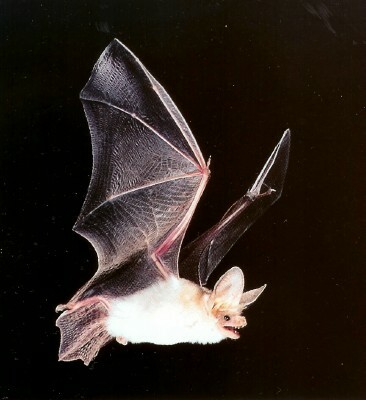 The pallid bat is common in arid regions with rocky outcroppings, particularly near water. This gregarious species usually roosts in small colonies of 20 or more individuals in rock crevices and buildings, but occasionally roosts in caves, mines, rock piles, and tree cavities. Relative to other bats, pallid bats emerge from roosts relatively late, but the time of emergence in the evening varies seasonally. Mothers and offspring may emerge and forage together. Pallid bats walk on the ground with a variety of strides and gaits, and they can hover or glide momentarily. They chiefly feed on large (2-7 centimeters or 1-3 inches in length) prey that is taken on the ground or, perhaps less frequently, in flight within a few meters of the ground or from the surfaces of vegetation. One or two babies are born in May or June. Females hang upright during parturition, and newborns are held in the curled interfemoral membrane. This is a common species throughout most of its range.